England closed in on a 2-0 series clean sweep on the fourth day against West Indies at Chester-le-Street, as West Indies slumped to 115 for 3 in their second innings, having been asked to follow on, 266 runs in arrears, shortly after tea. By the close, Shivnarine Chanderpaul and Lendl Simmons were fighting hard to stave off the innings defeat, but their hopes of the draw were dealt a huge blow when their first-innings centurion, Ramnaresh Sarwan, and their captain, Chris Gayle, were dismissed in the space of three deliveries from Graham Onions - Gayle having rampaged to 54 from 43 balls in an innings of massive intent. Up until the moment that Broad had Chanderpaul caught behind for 27 with a well-disguised offcutter, England had toiled with little luck or reward for an hour and a half of the morning session. Under clear blue skies, West Indies' fourth-wicket pair extended their partnership to 99, with the only real moment of discomfort coming when Sarwan, on 58, was struck a painful blow in the nether-regions. He upped his ante after Chanderpaul's departure, however, and rushed to his hundred with a blazing straight drive off Broad followed by a cracking pull in front of square. But those strokes merely stoked Broad's ire, and in a brilliant response he blasted Sarwan from the crease with a trio of vicious lifters, the third of which ballooned off his glove to Tim Bresnan at slip as he attempted to ride the bounce. England were jubilant, an opening had been forged, and when lunch was taken ten minutes later, West Indies were rocking on 188 for 5. But Brendan Nash and Ramdin dug in as best they could during an attritional post-lunch session, during which time England's seamers made a point of banging the ball in short, to test both the surface and the mettle of their opponents, but perhaps most of all, their own stamina levels. The policy eventually forced the breakthrough - but only as a side-effect - when Nash, hanging back in his crease in anticipation of another short ball, failed to transfer his weight into a front-foot drive, and under-edged Anderson onto his leg stump for 10. Jerome Taylor then came and went in a flurry of adventurous swipes, as Onions pinned him with an arrow-straight lbw, and at 216 for 7, the stage was set for another West Indian capitulation. Ramdin and Benn, however, had other ideas, and frustrated England for an hour during an enterprising 70-run stand for the eighth wicket. Ramdin was the principle aggressor, particularly against Swann, who produced one of the least effective spells of his brief Test career as he was mowed over the top for five fours and a six in 15 deliveries. At the other end, Benn took a while to get going, perhaps assuming that England were aiming for his helmet every ball, but he took his chance when the luckless Bresnan was brought into the attack. On 4, he feathered an excellent delivery from round the wicket, but Prior behind the stumps didn't flinch as the ball zipped through the gap with first slip. 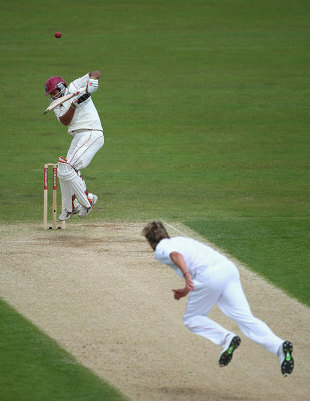 It's not impossible that that was Bresnan's best chance of claiming a Test wicket this summer. Hard though he tried, he was unable to produce the breakthrough delivery, and Benn was really beginning to enjoy himself when his demise was engineered in somewhat farcical circumstances. Another slog against Swann looped down towards Pietersen at long-on, who declined to go for the catch but instead pinged down the non-striker's stumps with Benn well short of his ground. With three balls to go until the new ball, that paved the way for the confrontation that the entire crowd had been waiting for. In came Edwards and back came Anderson, armed and dangerous after the peppering he had received while batting on the third day. Edwards was unbothered, however, and a visibly wound-up Anderson had the worst of the battle in their solitary over before the break, as he conceded two boundaries and earned a contemptuous pat of the pitch from Edwards as a misdirected bouncer whistled down the leg-side. On the stroke of the break, however, Broad clanged Edwards on the grille with a well-directed bouncer, and he claimed his wicket with the very next ball he faced, as Andrew Strauss did well to keep his eyes on the ball at first slip as Edwards climbed into a swipe across the line. His removal allowed Anderson to get his focus back to what he does best, and he needed only three more deliveries before Ramdin fenced outside off to complete superb figures of 5 for 87. By this stage, England's wicketkeeping duties were being carried out by Collingwood, after Prior was sent to hospital for an X-ray after taking a blow on his right ring finger. The injury was not serious, and he will resume his duties after a night's rest, but England were off the pace as they began the second innings. Gayle took full toll with a remarkable cameo that went some way towards silencing his critics. Gayle slapped his second ball, from Anderson, down the ground for six, and didn't look back after that. Anything too short or too full got the treatment, as he smoked six fours and two sixes in total, with Onions in particular getting some tap as he failed to locate his optimum length. At the other end, Devon Smith continued his woeful run against Swann as he was trapped lbw by the second ball he faced, but Sarwan began with intent, racing to 15 from 10 balls as England were made to work for their wickets. But their policy of banging the ball in short continued to pay dividends, and Onions - still fresh from the memory of his four wickets in seven balls at Lord's - showed a timely ability to repeat that sort of form. Sarwan had been pushed back into his crease when he was pinned lbw for 22 by a full-length ball, and then, one leg-bye later, came the big one. Gayle misjudged a back-of-a-length delivery, Strauss at slip pouched the chance off the shoulder of the bat, and England were left needing seven more wickets on the final day.